The Millie's Market Bag Pattern is large enough to carry groceries, to use as a beach bag, or to use as a diaper bag! 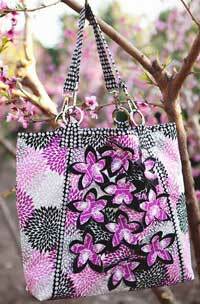 This pattern comes with instructions to decorate the front of your bag with floppy flowers which add a 3-D effect. There are large pockets inside and the finished size is 20" W x 15" H x 5" D.